Mr Robinson said NI's greatest strength should be speed in decision making. 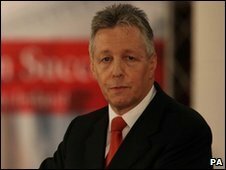 DUP Leader Peter Robinson has called for immediate changes to the working of the Executive which could enable any three parties to make a decision. Currently both the DUP and Sinn Fein can block any initiative they oppose. In a speech to supporters in Foyle, he said the present system encouraged stalemate and "party political point-scoring over good government". Mr Robinson called for an "informal non-binding agreement" between the Executive parties. This would require any decision to have the support of either the DUP and Sinn Fein or any three parties to pass. "This would ensure widespread support was required but would not allow any single party to have a veto on progress. It would encourage co-operation and compromise and end the potential of blackmail by stalemate," said Northern Ireland's first minister. "I am concerned that the failure of the Executive to take certain decisions is taking a toll on the Executive's credibility with the public. "As a small region of the United Kingdom one of Northern Ireland's greatest strengths should be an agility and speed in decision-making."